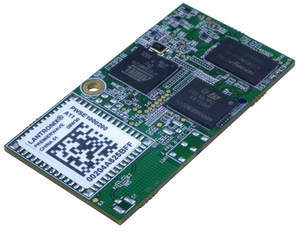 Lantronix, Inc. (NASDAQ: LTRX), a leading global provider of smart IoT (Internet of Things) solutions, announced the worldwide availability of its new PremierWave® SE1000 -- a high performance, programmable, Ethernet-based System-on-Module (SOM) that enables hardware and software engineers to quickly and easily develop and deploy secure industrial IoT applications. The PremierWave SE1000 SOM provides Ethernet networking connectivity to virtually any device and comes preloaded with full embedded Linux -- making it easy to add custom software and applications. The PremierWave SE1000 is designed to be a solution for embedded applications that require simple development, ease of use and a proven robust high performing solution with Ethernet connectivity. "Enterprises are now creating and adopting IoT and M2M applications to support mission critical activities across the organization, and this trend is driving the need for robust embedded solutions with two key requirements -- security and flexibility," said Joe Rocci, President at Phoenix Broadband Technologies -- a global provider of remote monitoring systems to broadband network operators. "The new Lantronix PremierWave SE1000 delivers on both of those requirements, through an easy-to-integrate, compact and cost-effective development platform for rapid network connectivity." "We designed the PremierWave SE1000 to meet the specific needs of design engineers and system architects whose projects require a proven network connectivity solution that's easy to integrate," said Vishal Kakkad, Director of Product Marketing for Lantronix. "By leveraging our feature-rich, high performance SOM, engineering professionals can focus on their own core competencies and projects, and leave secure network connectivity to us. Customers using the PremierWave SE1000 can now save significant time and money while producing cutting edge IoT applications." The PremierWave SE1000 has a recommended price of $79.90 per unit at 1,000 unit quantities. The entire Lantronix PremierWave® family of products is available for purchase directly at www.Lantronix.com, by calling (800) 422-7055, or through the Company's global network of distribution channels and reseller partners. For more information or general questions, please contact us at [email protected]. Lantronix, Inc. (NASDAQ: LTRX) is a global leader of secure communication technologies that simplify access and communication with and between virtually any electronic device. Our smart IoT solutions enable sharing data between devices and applications to empower businesses to make better decisions based on real-time information, and gain a competitive advantage by generating new revenue streams, improving productivity and increasing efficiency and profitability. Easy to integrate and deploy, Lantronix products remotely and securely connect electronic equipment via networks and the Internet. Founded in 1989, Lantronix products have applications in every industry, including medical, security, industrial and building automation, transportation, retail, POS, financial, government, consumer electronics, and IT/data center. The Company's headquarters are located in Irvine, California. For more information, visit www.lantronix.com. The Lantronix blog, http://www.lantronix.com/blog, features industry discussion and updates. To follow Lantronix on Twitter, please visit http://www.twitter.com/Lantronix. © 2014 Lantronix, Inc. All rights reserved. Lantronix and PremierWave are registered trademarks of Lantronix, Inc. Google Analytics is a trademark of Google Inc. Specifications subject to change without notice.